IF YOU HAD THE CHOICE WHAT WOULD YOU PICK FOR YOUR DESSERT? THE PINK BRA OR THE BAGS FILLED WITH LINDT CHOCOLATE???? And never forget – A Smile changes everything. I started writing early in life and everything I have written were always Self Help or How To books. So when I came to the United States many years ago I fell in love with a column which appeared in over 1000 newspapers at the time called DEAR ABBY. She gave advice and solved reader’s problems. Getting Over Growing Older: How to Change Your Life by Staying Positive by Brigitte Nioche is full of advice and helpful hints. I was looking forward to reading this book. I will say that the book is easy to read, laced with bits of humor throughout . 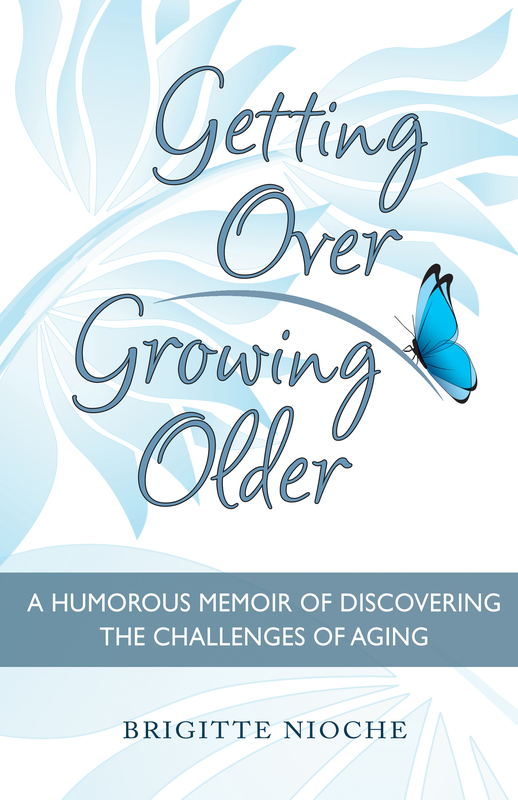 Perhaps it was because from the reviews I was expecting the book to be more of a mental positive encouragement on growing older gracefully more of a Katie Byron style. Instead I felt it was more like a physical makeover through a monologue from a Dear Abby perspective. Dear Abby – really? So maybe there still is time to make my dream come true? Can I start with you? Don’t you have any questions? Don’t you need advice? Aren’t you in doubt about your relationship? Your Job? Or maybe you don’t know how to handle the annoying neighbor who just moved in.? Just ask me anything you want! Leave your question right here and my answer will be on the way. Looking forward to hearing from you! SENIOR MOMENT? NO INFORMATION OVERLOAD! If forgetting something is a senior moment than a lot of young people have senior moments —- because they too forget things! But their busy lives gives them a pass, whereas when an older person doesn’t remember it is seen as a result of being older. I think the truth, for young and old, lies somewhere in the middle. The constant bombardment of the news media, new inventions from Silicone Valley, advertisements, as well as the attachment to our new life lines like the iPhone, Smart Phone, Kindle, Podcast, Facebook, and many more I am not even aware of, are like an explosions around us. And often this new information is valid today and gone tomorrow. People do not decline mentally with age, it just takes them longer to recall facts because they have more in information in their brains. Much like a computer struggles as the hard drive gets full, so too, do humans take longer to access information when their brains are full. Our brains are not just full they are overloaded and attacked on a daily basis. And not being able to take it all in, not being able to process it all, makes older people feel like their brains are not function as before. Before was different. The world has changed and as hard as we try to take it all in, there will be moments for everybody – young and old – that will seem like a senior moment but are just an overload in your mental computer. No. I don’t have birthdays anymore, but my friend Judy was not aware of it and on my last birthday send me this card. It made me wonder if maybe I should have birthdays again so I can buy more shoes? A few days ago I ran to catch the bus, and you guessed right I lost my footing and tripped. Best advice I had in a long time. It’s like I said in my book, don’t tell your age because people will treat you differently once they know how old you are. So let me repeat – when you tripped you didn’t fall – you tripped!